Sprint, sled or speed your way to success with some sensational training turf to put the pizazz back into your fitness studio. 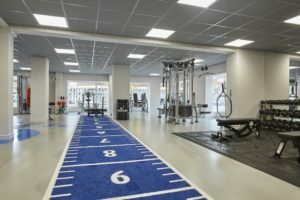 If your gym is still without a sprint track, let Boutique gyms mark out the huge benefits for you and your members. Sprint tracks offer a feature that can instantaneously revolutionise the appeal of your fitness facility, without costing the earth. Their vibrant, visual impact can be as explosive as the workouts that take place on them. Sprint tracks can define functional training zones, and define who you are with the appropriate equipment for your programmes and classes, the right colour choice and some exclusive extras, such as bespoke branding and graphics. Speed tracks are not just for sprinting. They offer greater versatility and dynamism than you might think. The hugely popular sled pulling and pushing, plyometric training, battle rope and tyre flipping activities all require a stage on which to perform, and one which will go the distance. For Virgin Active’s HEAT programmes, training turf and track play an integral role in developing the liveliest fitness communities. Fear not if your studio is on the smaller side. Some of the most compact gyms have reaped the greatest rewards from installing training track. With our design expertise and workout programming tips, personal trainers will shine with the most inventive of methods to motivate and inspire. Tracks can be manufactured from all kinds of materials, such as rubber, synthetic turf, polyurethane and vinyl. As with all flooring products, they need to be accompanied by a quality backing, to be comfortable, and be made to withstand the toughest training drills. As an approved stockist for market-leading Netherlands-based company Sprint Tracks, Boutique gyms believes their products are unrivalled in their quality and capacity to promote supreme functional workouts. With a range of stunning colour choices and extreme high fibre density, Sprint Track’s artificial turf is perfect for CrossFit training and power fitness. The artificial grass is put through its paces in a series of extensive tests to guarantee safety and durability. The combination of a short fibre and high density makes it a wear-resistant wow investment. For more information and inspiration, check out our Sprint Tracks brand section.